TSTU is a peptide coupling reagent converts carboxylates to N-succinimidyl active esters. 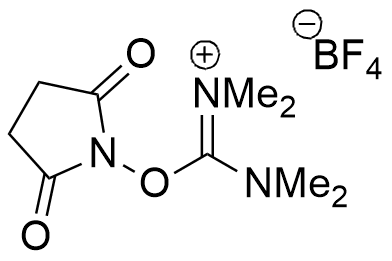 TSTU is used in intramolecular cyclization of 2-acyl-benzoic acids mediated, leading to diversely substituted (Z)-3-ylidenephthalides. The application of the method is highlighted by gram-scale preparation of the antiplatelet drug n-butylphthalide. TSTU, HOSu, and CuCl2 have been applied as coupling cocktail, proved to completely eliminate the racemization of the carboxy-terminal N-methylamino acid residue during segment condensation. Polymer-TSTU and Polymer-HSTU have been prepared from polymeric Nhydroxysuccinimide (P-HOSu) and used as solid-supported reagents for peptide coupling reactions. B. H. Xinhua and X. Fengtian Tet. Lett., 2014, 55(11), 1956-1958. Y. Nishiyama, S. Ishizuka, T. Mori, and K. Kurita Chem. Pharm. Bull., 2000, 48(3), 442-444. R. Chinchilla, D. J. Dodsworth, C. Nájera, J. M. Soriano, and M. Yus ARKIVOC (Gainesville, FL, United States), 2003, 10, 41-47.